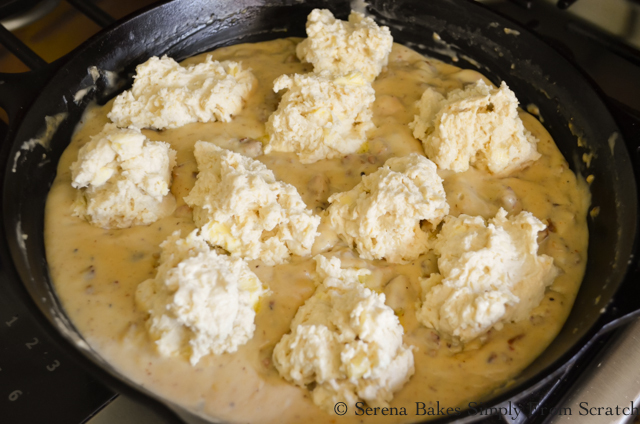 There are Biscuits and Gravy, and then there are Lord Have Mercy Skillet Biscuits and Sausage Gravy Casserole. These just happen to be the later of the two. Colt loves Biscuits and Sausage Gravy, and I happen to love lazy weekend mornings. 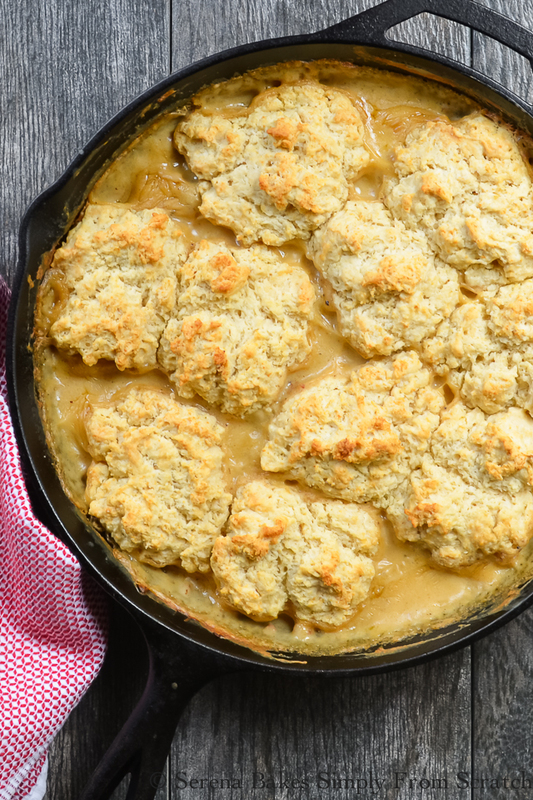 Skillet Biscuits and Sausage Gravy makes everyone in our house happy for multiple reasons. 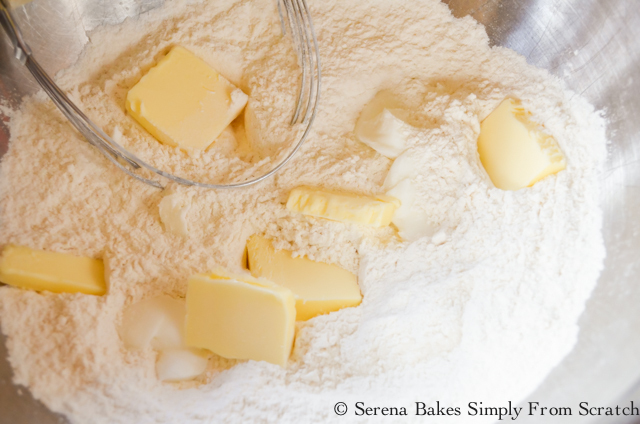 No need to roll and cut biscuits, which means no flour mess first thing in the morning. It's deliciousness friends, pure unadulterated deliciousness! 1 pan and a bowl = less mess! No one wants to be washing dishes on the weekend! It's from scratch, no canned biscuits need, yet super easy to make! Did I mention it's like Heaven for your mouth. 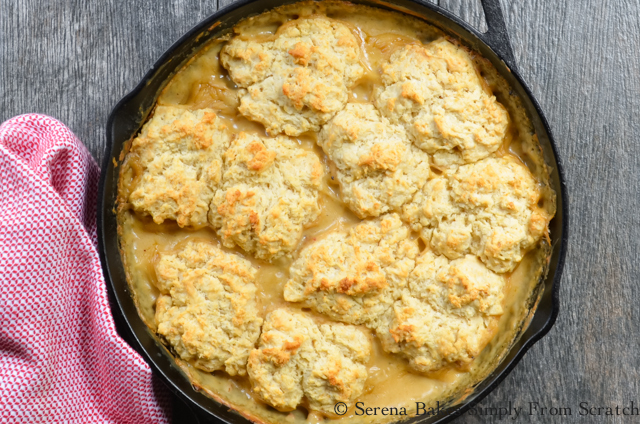 Make Skillet Biscuits and Sausage Gravy Casserole this weekend, I know it's happening in our house! The people you feed will thank you, and so will your taste buds. 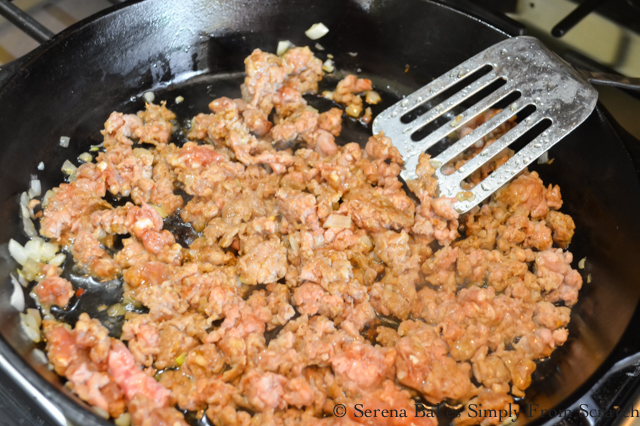 In a large oven proof skillet like cast iron add 1 tablespoon Extra Virgin Olive Oil, 1 whole Finely Chopped Shallot, and 1 pound Ground Breakfast Sausage. Cook over medium-high heat until sausage is brown. 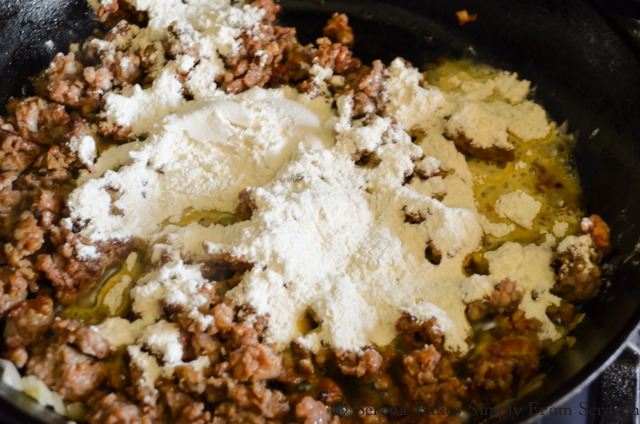 Sprinkle 2/3 cup All-Purpose Flour over cooked Sausage. Stir until flour is absorbed by grease. Slowly stir in 1 cup Chicken Stock to prevent lumps. Whisk in 2 cups Milk and bring to a simmer. Cook about 4 minutes until thickened. In a large bowl combine 1 3/4 cup All-Purpose Flour, 1 tablespoon plus 2 teaspoons Baking Powder, 1 teaspoon Sugar, and 1/2 teaspoon Salt. 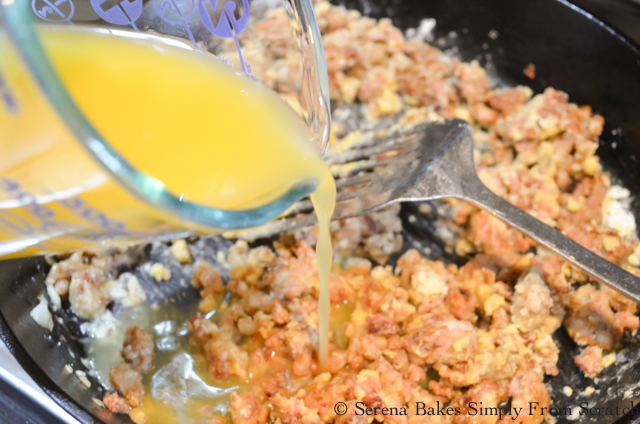 Cut in 3 tablespoons Shortening, and 1/4 cup Butter, cut into tablespoon sized pieces, until butter resembles pea sized crumbs. Slowly stir in 3/4 cup Milk until combined, but being careful not to over mix. 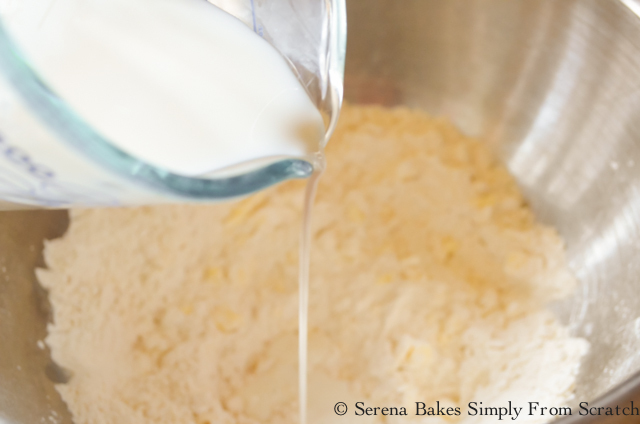 Dough should stick together, if not add an extra 1-2 tablespoons Milk. Drop 10 equal sized spoonfuls of dough over sausage gravy. Bake in a 400 degree oven for 25 minutes or until biscuits are golden brown and a toothpick inserted in the center comes out clean. Light, fluffy drop biscuits cooked over the top of hearty sausage gravy is the perfect start to any morning! Easy and delicious! Who needs breakfast out when you can have breakfast in?? 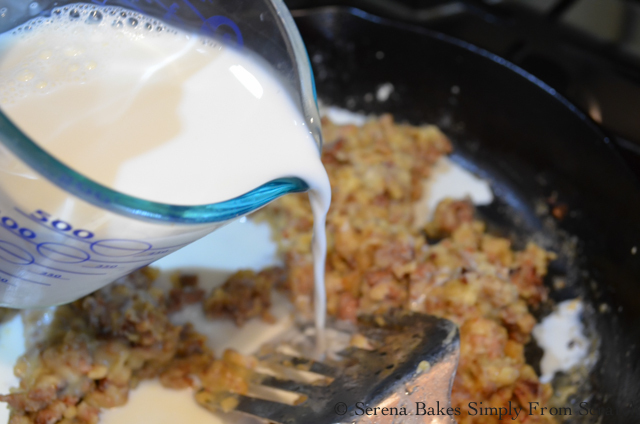 Easy to make Skillet Biscuits and Sausage Gravy Casserole is a favorite for breakfast or dinner! In a large oven safe skillet like cast iron, add olive oil, shallot, and sausage. Cook over medium-high heat until sausage is lightly brown. Sprinkle 2/3 cup flour over the top of sausage. Stir in flour until absorbed by grease. Slowly stir in chicken stock, and then 2 cups milk, to prevent lumps. Bring to a simmer and cook about 4 minutes until thickened. Add salt and pepper to taste. 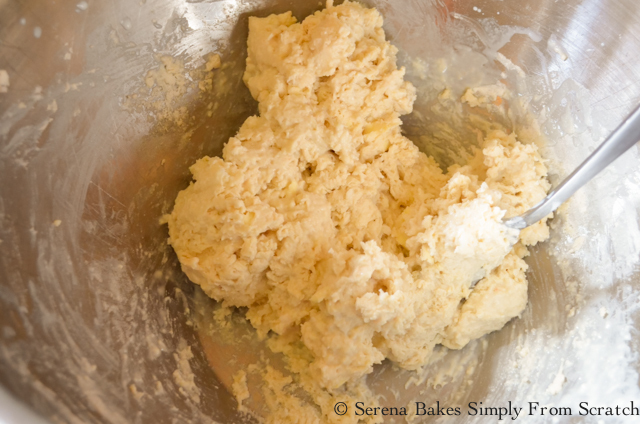 In a large bowl combined 1 3/4 cup flour, baking powder, sugar and salt until well combined. Using a pastry cutter or fork, cut in butter, and shortening, until mixture resembles small peas. Slowly stir in 3/4 cup milk, until dough sticks together. Be careful not to over mix. Add an additional 1-2 tablespoons milk if needed. 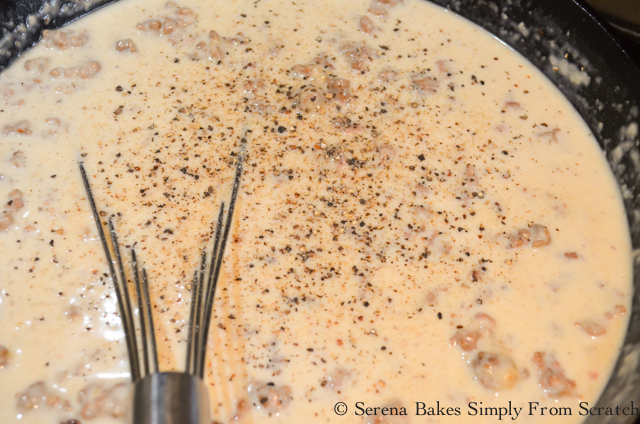 Drop 10 equal sized spoonfuls of biscuit dough over the top of sausage gravy. Bake for 25 minutes, or until biscuits are golden brown, and a toothpick inserted into the center of biscuit comes out clean. This is creative! I can see why it's a favorite! i love that this is made a cast-iron skillet, my favorite kitchen tool! Oh man, I NEED to make biscuits this weekend! I'm not a huge camper but I would make this any day of the week! Looks so good!